George Washington Vanderbilt's vision for his Biltmore Estate was not limited to his grand mansion, but included a picturesque, manorial village that would serve as an ornament of the landscape and solve the practical problem of housing estate workers and servants. 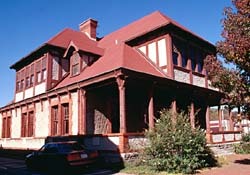 The architect of the Biltmore Estate, Richard Morris Hunt, was also responsible for three of the architecturally significant buildings of the Biltmore Village, including the Estate Office, constructed from 1894 to 1895. As early as 1893, the need had already arisen for a management office for Vanderbilt's massive estate. 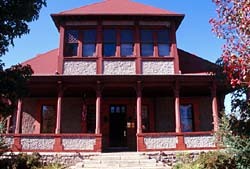 Hunt employed his Biltmore vernacular style of brick and pebbledash walls and red clay tiled roofs in his design of the Estate Office. The handsome one-and-one-half story building features prominent half-timbered dormers on each elevation and a large engaged porch across the front which faces the Plaza. Fine carved wood trim enhances the building. In addition to housing the office for estate manager Charles McNamee, the Estate Office also served as the office for Vanderbilt's Biltmore Village rental properties. When the estate was officially opened to the public in 1930, tickets were purchased from this location. Later in the 1930s the estate office was sold to the Asheville Fire Department, and garages for the fire trucks were accommodated behind the office. In the 1970s, Biltmore Estate repurchased the building and it currently houses the offices of the Biltmore Company. The Biltmore Estate Office is located at 10 Biltmore Plaza on the corner of Lodge St. within the Biltmore Village Multiple Resource Area. It is not open to the public.